What’s in a name? Shakespeare by any other name would surely smell as sweet! 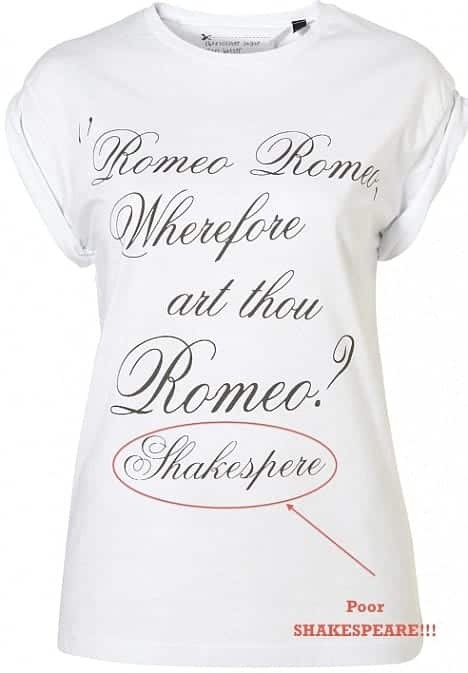 However, anyone who’s read this article on how Shakespeare’s name was spelled will appreciate that the spelling in Shakespeare’s day was flexible…and was even spelled the same way as TopShop’s “incorrect” effort. So, maybe they’re not so stupid after all! After a Shakespere (or even a Shakespeare!) tshirt? Check out our very own Shakespeare shop, selling everything from books to lego Shakespeare men.